*The Sacred Feminine Cycle~ This class focuses on the Sacred Feminine's fertility cycles, while also becoming aware of our bodies rhythmic connection to the elements, directions and the cycles of the sun, moon and earth. We will discuss Fertility Awareness, Our Body as a Temple, Self-Confidence, Priestess Wisdom and Ritual. *Conscious Pregnancy~ This class focuses on nurturing Conscious Pre-conception, Pregnancy and Birth. We will explore the ancient wisdom of creating a sacred and healthy space for conceiving, growing and birthing babies. We will discuss nurturing and supportive herbal remedies, nourishing nutrition, and trusting the divine process of creating and bringing forth life. *Exploring the History and Safety of Homebirth in the World~ This class focuses on the history of Childbirth and how over the last 200,000 years humans have gone from 100% of babies being born at home to less than 1%. We will explore how Midwifery became outlawed through propaganda and the persecution of witches, the uprising and industrialization of hospital birth over the last 100 years, the recent revival of women choosing Homebirth and the re-legalization of Midwifery. We will also discuss the safety and comfort of giving birth consciously at home with trained professional midwives compared to the contemporary medical practices of hospital birth. *Conscious Childbirth Classes~ This class focuses on Conscious Childbirth. 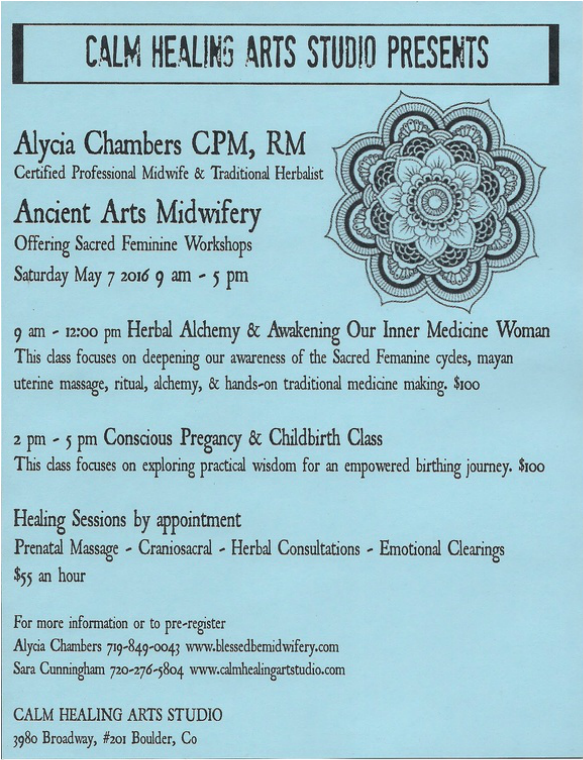 We will explore the divine process of natural birth, empowerment of birthing women, rites of passage and the initiation of motherhood, the phases of labor, relaxation and comfort techniques, surrendering fears based around childbirth in the media and cultural conditioning, herbal wisdom and remedies that support a healthy birth and how to prevent complications at home. *Herbal Alchemy and Traditional Medicine Making- This class focuses on growing, identifying, wildcrafting and harvesting herbs. We will discuss the traditional medicinal uses of herbs and how to prepare your own herbal remedies, herbal salves, herbal tinctures, and flower essences.